...they were ignored. My son was quite content easing into a weekend of World of Warcraft, and I was as amicable to a weekend of Runescape, our respective addictions. And so we shared proximity, but not deep thoughts. Deep thoughts were also not a likely occurrence as his friend, Chase, visited for a two-night sleepover, thus remaining an "all boys weekend," just with amplified teenage goofiness. On Saturday, we all took a gaming break, and took in Cherry Icee's and a bucket of popcorn during the matinee screening of "The Incredible Hulk." Having seen the previews, I told them I would drop them off, then waffled and ultimately watched the movie. I admit it. I was raised on comic books, and I'm a sucker for the related movies. Deep thoughts... were not stirred by this movie, either. Hulk was never a favorite, and I never quite understood a fan base for a character that, at his most eloquent, grunts, "Hulk Smash!" The movie takes a page from the Bill Bixby series, concentrating on the "on the run" aspects of the story, which it does reasonably well at the beginning. 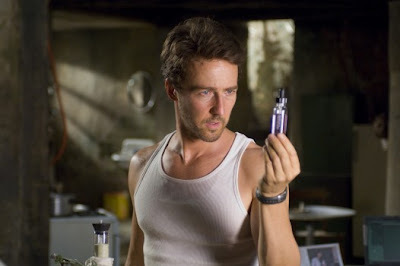 Edward Norton, while turning in a passable performance as Dr. Bruce Banner, is not a particularly sympathetic actor, so there is little emotional attachment of whether he lives to run another day. Does this look like a scientist? The more surprising acting weakness is turned in by William Hurt, who typically excels at emoting in his various roles. His General Ross, however, is cartoonish (I know, I know... what did I expect? ), wooden, and a bore. And with the lead role occupied by a computer-generated, oversized Shrek (without the humor), this boils down to the visual equivalent of "Bruce Run! Hulk Smash!" Deep thoughts? No. Enjoyable enough for watching (once) on DVD instead of the theater? Yes, if nothing else is on. It's probably better than Ang Lee's 2003 "Hulk," but my thought is that they're both limited by the source material. In fact, I think Hulk would have made a far more interesting villain. Dogs saving lives aside, in order for something to be heroic, there has to be something human involved, and, as Dr. Banner admits, there's mostly noise in Hulk's head.... no deep thoughts in Hulk's head, either. There is a clever cameo by Marvel creator Stan Lee, an obligatory one with Lou Ferigno (who apparently hasn't heard of the dangers of steroids, though looking quite ready to reprise his TV role), and a franchise inclusion of Robert Downey that sets up an Avengers movie in 2011, which combines Hulk, Iron Man, Spiderman, Wolverine, and possibly others. Overall it was good escapism for an all boys weekend, if not a particularly good movie. I am glad to hear that I am not missing anything by waiting till the movie comes out on video. I saw the first one, and was left going "eh". Although I do like Edward Norton, it is generally as eye candy and for that delicious voice than for his acting ability. (I know, I know, TMI right?) I find it interesting that you didn't mention Liv Tyler? How did she do? Liv has done better elsewhere, but she has little to work with here. At times I thought she was very pretty, at other times I was thinking she's aged. Obviously, I wasn't caught up in her character. She has a fair amount of screen time, but her role is largely to help move the plot from A to B. She gets a pass and, likely, a nice paycheck.